This unique collection of vehicles and Accessories was started by Mr. William Smith, who was very particular about the authenticity and impeccable condition of each carriage. This tradition is now continued by his daughter Caroline Dale-Leech, who has spent her life with horses and driving, learning from her grandfather as well as her father. 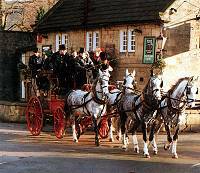 The present Collection includes a Stage Coach, Royal Mail Coach and numerous other private and commercial vehicles. One of the more unusual aspects of the collection is that it is a working museum, and the owner ensures that the vehicles are regularly out on the road being used, not locked away behind closed doors. An ideal all year venue, as much is under cover. Visitors are welcome to browse around at their leisure. Guided tours available for group bookings. School parties and clubs especially catered for. Take a fascinating look behind the scenes at the vast array of spotlessly kept harness and tack, admire the collection of collars, travelling boxes plus the fine collection of coach horns. If you are lucky you may see the Blacksmith at work, or the staff grooming the horses, tacking up and carrying out the endless job of cleaning the harness and vehicles. Finally, of course you can meet the real workers - the horses and ponies who work at Red Stables Carriage Museum. All the vehicles have worked regularly in films and TV. Please telephone to enquire for details of Coach Tours. We like to cater for the partially disabled, and there are facilities available. The stables and museum are all accessible. Just off the A6(between Matlock and Bakewell), 13 miles from the M1(junctions 28 south and 29 north), 10 miles from Chesterfield, 20 miles from Sheffield and Nottingham and 42 miles from Manchester. Nearest railway station is Matlock, and Chesterfield is on the main intercity line.